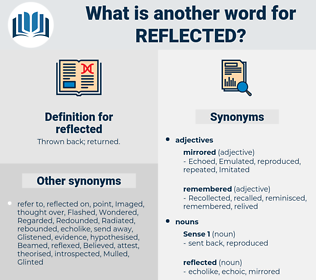 What is another word for reflected? reflections, reactions, responses, complaints, views, opinions, wishes. related, reacted, represented, represents, representing, illustrated, depicting, affected, characterized, Indicated, Indicating, indicates, correlate, respect, respected, correspond, corresponding, Corresponded, demonstrated, attributable, revealed, representative, referenced, result, Resulted, effect, reactivated, conforming, Conformed, articulated, described, Reiterated, recognize, recognized, Recognizing, respond, Responded, recognise, recognised, reinforced, Encompassed, suggested, reaffirmed, reported, collected, restored, Attributed, emphasized, detected, considered, recaptured, Testified, certify, Relied, covered, responsive, Cited, addressed, Contributed, underscored, acknowledged, Acknowledging, emphasised, observations, Explained, registered, directed, recovered, identified, constituted, Told, included, contained, Containing, contains, coincide, Coincided, repeated, Explored, classified, confirmed, conveyed, realized, felt, stressed, reproduced, involved, Exemplified, anticipated, Pertained, highlighted, treated, summarized, consistent, recorded, Deliberated, Captured, projected, Followed, expressed, Expressing, Introduced, signified, satisfied, underlined, inscribed, implemented, centred, Generated, reconvened, elaborated, bore, expected, description, Replied, appropriated, retained, outcome, reversed, derived, implied, evoked, ignored, determined, outlined, disclosed, discovered, note, noted, relayed, accepted, declared, Consisted, attest, attested, informed, Adhered, Epitomized, renewed, received, Mentioned, specified, featured, Offered, concerned, inspired, presented, showcased, Investigated, observed, concluded, taught, Encountered, fulfilled, realised, Caught, Appeared, Paralleled, gathered, asserted, proved, Manifested, denote, Denoted, Trafficking, Examined, appreciated, Displayed, displays, Stipulated, affirmed, learned, Emerged, disregarded, dedicate, dedicated, acquired, exhibit, Exhibited, exhibits, faithful, collection, focused, focussed, Was, Were, showed, Performed, exposed, remarks, assumed, struck, Carried, agreed, briefed, Served, Enshrined, uncovered, enrolled, expression, Equalled, define, defined, Upheld, Returned, regained, ended, attached, Listened, Resumed, account, Accounted, Arose, noticed, produced, stemmed, Argued, Dealt, Signaled, signalled, Pondered, charged, Invoked, Commented, comments, trusted, Came, alleged, matched, accused, Wore, Discussed, Issued, extended, left, increased, crossed, Answered, rule, established, controlled, Yielded, pursuant, Heeded, Brought, Entered, posed, pointed, Provided, like, initiated, spoke, tested, testing, Urged, published, Threw, Acted, listed, lists, Submitted, granted, paints, Became, Caused, Remained, Quoted, Complained, advised, Met, prepared, said, mainly, fell, due, committed, continued, voiced, given, Gave, Totalled, placed, mark, marked, paid, drew, led, figured, laid, spent, Had, Envisaged, Took, Expounded, Stood, Meant, situation, saw, Consigned, intended, Picked, Weighed, count, Counted, Logged, thought, Looked, set, developed, Obtained, supreme, Claimed, posted, Deposited, found, Hoped, joined, tried, raised, status, planned, seized, Asked, maximum, Wished, main, who, put, Amounted, Gained, Went, based, Did, Got, numbers, made, named. incorporated, related, reacted, represented, illustrated, depicted, affected, characterized, Indicated, respected, correspond, Corresponded, demonstrated, revealed, Replicated, reference, Accommodated, altered, categorized, referenced, refer, Referred, Resulted, characterised, protected, encapsulated, articulated, described, selected, integrated, calculated, operationalized, recognisable, Translated, recognized, Responded, recognised, reintroduced, Capitalized, suggested, reaffirmed, report, reported, reporting, perceptible, collected, predicted, connected, restored, Attributed, emphasized, Tackled, regulated, detected, certified, Comprised, considered, recaptured, revisited, Relied, accumulated, covered, Cited, addressed, interpreted, Contributed, underscored, Extracted, Contemplated, acknowledged, emphasised, observations, transcribed, Explained, clarified, circulated, registered, directed, recovered, abstract, abstracted, retabled, clustered, regard, Regarded, response, Discriminated, Reverted, materialised, identified, Told, internalised, restated, distinguished, concentrated, included, contained, instructed, ascertained, repeated, Explored, classified, Rendered, confirmed, Symbolized, realized, felt, Excluded, stressed, disaggregated, actualized, rediscovered, guaranteed, reproduced, involved, consolidated, Exemplified, understood, reduced, anticipated, refined, reclaimed, reinstated, synchronised, highlighted, treated, summarized, substantiated, portrayed, recorded, allocated, utilized, Captured, projected, perceived, Followed, expressed, Introduced, ec, satisfied, Borne, impact, impacted, underlined, inscribed, implemented, fostered, perceivable, combined, Enacted, recounted, Materialized, observable, confined, Generated, reconvened, Delivered, elaborated, structured, deducted, expected, Retrieved, dictated, pictured, measured, recommenced, Replied, forecast, Transferred, reasserted, appropriated, Communicated, retained, Created, formulated, reversed, derived, revived, located, converted, implied, accrued, evoked, embodied, Collated, written, ignored, determined, principles, credited, outlined, disclosed, summarised, cleared, retaken, Administered, validated, transformed, adapted, discovered, distributed, Tabulated, detailed, noted, Incurred, mainstreamed, labelled, Inserted, reworked, accepted, Regretted, foreseen, Equated, declared, enforced, Consisted, localized, attested, Reached, informed, Epitomized, Subjected, renewed, received, Mentioned, released, Transpired, specified, strengthened, enclosed, featured, delineated, Offered, concerned, inspired, presented, showcased, tailored, Investigated, reviewed, synthesized, observed, interrogated, verified, concluded, Encountered, entrenched, fulfilled, conducted, realised, reprinted, fit, proven, Filed, transposed, Caught, absorbed, Appeared, adjusted, gathered, accomplished, restarted, asserted, Influenced, proved, Contended, Compiled, practised, Targeted, Exercised, proposed, Enumerated, Advocated, accompanied, travelled, Manifested, settled, Denoted, authorized, Examined, Aggregated, entitled, finalized, prescribed, Occurred, ventilated, composed, handled, endorsed, updated, overlooked, apportioned, read, Promoted, justified, redone, appreciated, Reaped, faced, executed, employed, encumbered, Displayed, Stipulated, Duplicated, deferred, Drafted, learned, Emerged, dedicated, Assessed, acquired, Shown, supported, Exhibited, Worked, pronounced, visible, associated, evacuated, focused, Heightened, briefing, showed, Performed, Prosecuted, documented, Undertaken, exposed, Deplored, assumed, reasoned, Carried, valued, stored, enroled, Channelled, designated, Served, Enshrined, Been, manifesto, enrolled, fed, defined, devoted, Upheld, Returned, advertised, preserved, regained, Arisen, Evinced, Enunciated, withdrawn, reopened, attached, analysed, unobstructed, Achieved, monitored, Resumed, Accounted, touched, printed, noticed, Screened, produced, Seemed, Argued, Dealt, transmitted, pledged, ensured, signalled, conspicuous, warranted, evidenced, situated, dissipated, Emitted, Pondered, spelled, charged, Invoked, pursued, comments, assigned, Succeeded, alleged, matched, added, sustained, Helped, processed, Discussed, Issued, extended, left, crossed, Answered, dominated, interviewed, change, Denominated, used, arranged, turned, come, cascaded, attained, established, Accorded, checked, controlled, Yielded, tracked, pursuant, Heeded, scheduled, Brought, Entered, compliant, adopted, posed, pointed, applied, Notified, Provided, spoken, codified, Shifted, experienced, Defended, organized, initiated, donated, secured, chosen, maintained, tested, assembled, memorandum, Viewed, published, stuck, forbidden, Harvested, admitted, Supplemented, withheld, listed, Submitted, granted, witnessed, Caused, fallen, Surveyed, elapsed, Remained, Quoted, Complained, advised, viewable, Met, budgeted, prepared, titled, studied, sampled, said, postponed, committed, Voted, engaged, divided, shared, continued, imported, voiced, become, guided, given, earned, Undergone, invented, placed, Earmarked, announced, invested, table, tabled, grown, imposed, nominated, incidence, drawn, marked, opposed, suited, paid, Lodged, mandated, linked, led, equipped, rebounded, played, Begun, taken, fixed, Supplied, embedded, laid, Deemed, Approached, Worded, spent, ranked, Had, Envisaged, surrounded, see, seen, Arrived, advanced, aligned, Meant, sent, Talked, called, Detained, cast, copied, Consigned, intended, Picked, Weighed, CODED, held, heard, Awarded, grouped, Counted, Grounded, Logged, Judged, thought, Looked, Visited, formed, set, developed, Obtained, supposed, HIT, shaped, height, Claimed, posted, backed, patented, find, Waived, needed, driven, found, party, sync, synced, Devised, expended, bound, Hoped, built, Modelled, tried, billed, seated, suspended, raised, Passed, poised, status, downloaded, handed, Questioned, planned, seized, Mapped, punished, Asked, Shipped, attempted, desired, known, appointed, 2007, kept, designed, put, Bundled, programmed, Happened, founded, packed, booked, Gained, gone, based, done, Got, made, named. For a moment he reflected that, once down there, it would be impossible to return the same way.
" I really should telephone Mrs. Gallup that I'll be late for supper," Penny reflected. reflexed, ray of light, replicate, reflect, rifle shot, revivalist.